What about that Cut-Away over the Cabin on the 701 ?? I’ve often wondered about that strange cut-away over the cabin of the 701. Hardly any other aircraft do it, so why does Zenith do it for the 701?? Is there any real advantage?? Or maybe even a disadvantage?? When faced with questions like that, I have to do some testing and find out what’s really going on..... So I set up video tuft testing to compare the airflow over the cabin of a 701 and a Savannah. The results were very revealing! Fuselage top of the 701 at full power climb at 50 kts. Stable airflow. Top of the 701 at idle power at 46 kts. totally disrupted airflow, right back to the tail. Temperary airfoil ripping loose at 40 kts. 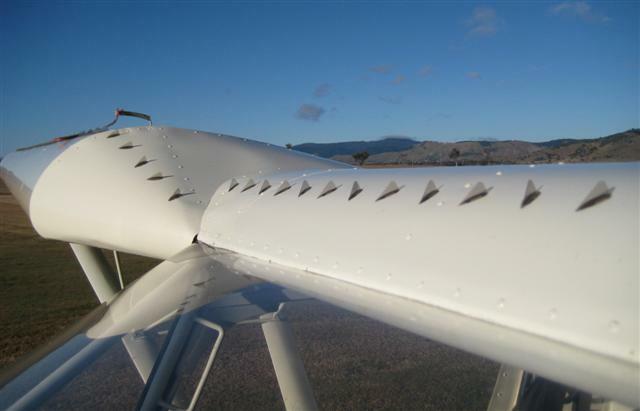 Demostrates the amount of lift generated by an airfoil here. Also demonstrates that whatever is installed there, it needs to be very sturdy to carry that lift. 701 wing roots considerably disturbed at 50 kts. 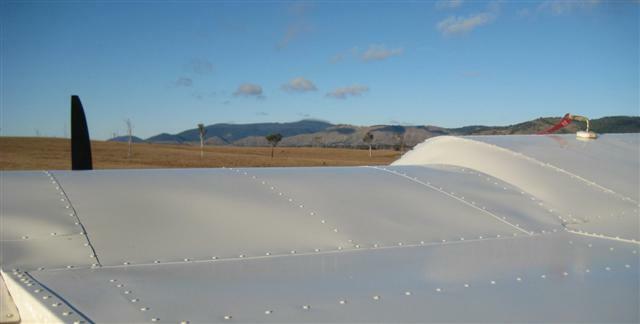 Airflow over the top of a Savannah at 26 kts indicated. Big difference from the 701, eh..... Lots more lift, less drag. The tufting showed that the flat cabin of the 701 top stalled suddenly and completely at 46 kts, and was very distrurbed all the way back to the tail. While that same area on the Savannah was still flying right down to 26 kts indicated. That’s one heck of a difference!! Losing all that lift and gaining the drag and disruption to the airflow is really significant, especially right when slowing down and transitioning to landing attitude. The Savannah does that transition much smoother than the 701, which has a tendency to suddenly drop at slow speed. Not surprising, when the wing has just suddenly lost lift on a 5ft section, and gained considerable drag. We tried VGs on the windshield, but there’s no way that they could make the air flow around that abrupt corner and then stay attached to a flat surface like that. So we made up a temporary partial airfoil about 50mm (2”) thick to ease the air around that corner, and taped it on securely with duct tape. But on the test flight, the trailing edge ripped loose just at lift-off and flapped alarmingly until Hans was able to land again. This certainly demonstrated how much lift was being created by that minimal airfoil. Due to other commitments, Hans hasn’t had the time to make up a proper fill-in for the cabin top. 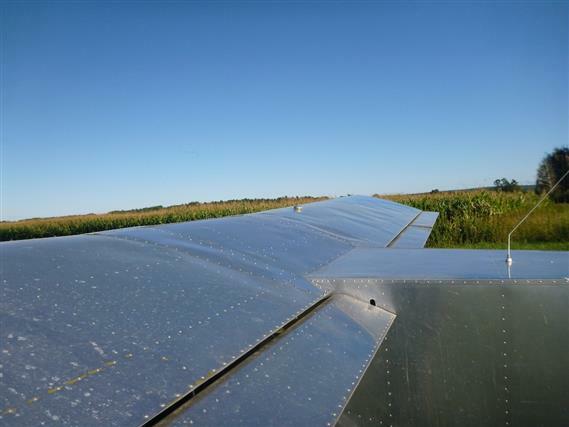 When 701 flyer Joe in Mississippi heard these results, he made up an airfoil section to cover the cabin top. 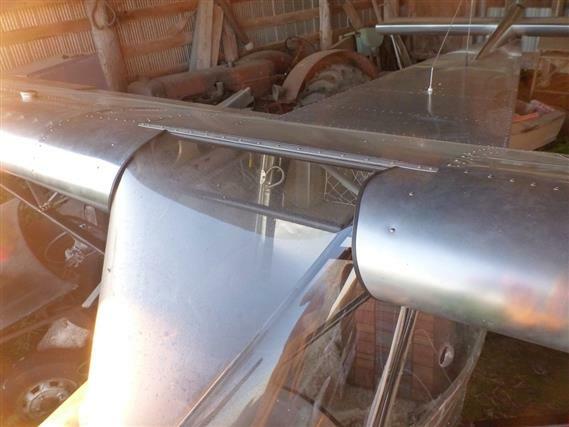 It couldn’t be the same full profile as the rest of the wing, due to the way the windshield meets the cabin top, so he made up a partial airfoil about half as thick as the wing. See the photographs. Looks really good I reckon, much better than before, and more head room. > In John's Stolspeed website I saw a reference to the loss of wing area because of the gap in the wing over the cockpit. I just did a partial airfoil mod for that gap. I call it the Beanie Mod cause at first that's what it reminded me of. I'm used to how it looks now so that's no big deal for me...and if I cared how a plane looked I wouldn't have built a 701. Well, anyway, it made an astounding difference in the way my plane flies... much more forgiving when really slowed up. I can shoot idle approaches with one notch flaps at 40 mph calibrated airspeed and have plenty left to flare with; there isn't all that pitch excursion business that it used to be so bad about. And with a little more care I can shoot 35 mph idle approaches with 2 notches flaps and have enough to flare to a nice touchdown; but just a touch of power makes that one properly conservative. 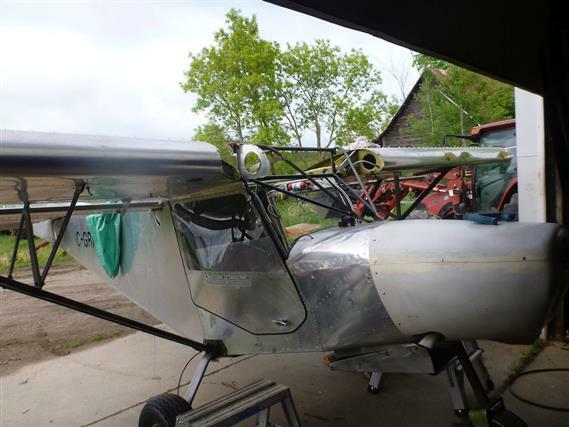 This thing actually flies like a STOL plane should now, honest, predictable, even, do I dare say...forgiving! > When I pull on it when slow the nose just comes up and up, it doesn't fall out from under you like it used to... 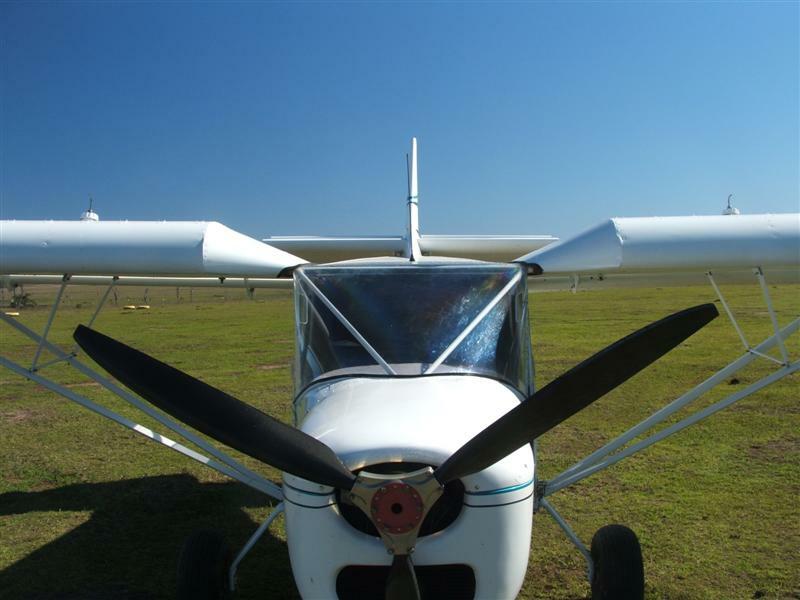 I found that the windshield junction with the flat fuselage top stalls at like 45 mph, apparently disrupting the airflow over the tail and causing the pitch stability problems mine has always had. Well that pretty much verifies what we would expect from such a mod. No wonder Max Tedesco gave the MXP740 the full airfoil over the cabin. 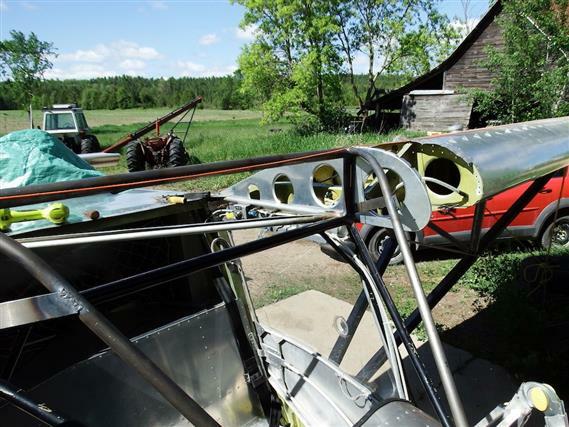 More comments from Joe-The pitch instability is gone, the oilcanning is gone as long as the rudder is coordinated. That improvement in the response of the elevator and rudder was a surprise. Joe had removed his slats long ago, and streamlined his struts, both of which reduced the parasite drag dramatically. As Joe adds, the Beanie Mod will probably not be as effective on a round strut, slatted bird, cause there’s already so much more drag/turbulence at work there, lessening the effectiveness of the Beanie..
Hans has now done a ‘Beanie Mod’ on his 701. He notices the same handling results as Joe stated above. More consistent lift and elevator authority at landing speed and less buffeting from turbulence. Tuft testing shows that the aft part of the surface is still stalling at about 45 kts, even with VGs, but not the whole surface stalling so dramatically as before with the flat cabin top. We used the profile of a section sliced from the wing profile as shown in the photo. We may try carrying the height farther back such that the aft portion blends in better with that portion of the wing on either side. But even as is, it’s a big improvement. We also modified that diagonal cross-member that’s such a nuisance for passenger head room. The photo shows how we joined it to the existing supports to give more clearance, and then put a bend in the middle to raise it even further. The bolted fittings at the ends are stronger than the riveted fixing of the original, and the bend in the middle is reinforced, so the whole structure is at least as strong as the original. It makes a big difference to the headroom in the cockpit. Now have a look at Bob Stuart's modified 701! He's done a full fill-in and the results are brilliant. and more wing area providing more lift and less drag..
And a very tidy job to boot..... Looks great! A bigger windshield with better visibility, and lots more headroom. that showed a lot of turbulence in tuft testing. These photos will show the modifications to the structure to carry the new windscreen and turtle deck. 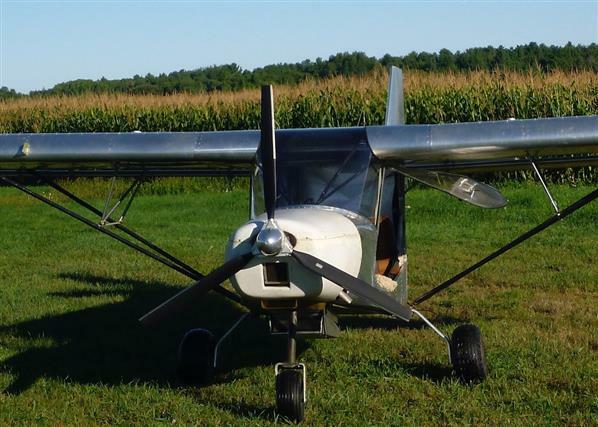 Wing mounts are unchanged and the cabin structure is unchanged to carry those loads. Just added the extra structure to carry the windshield and over the top.